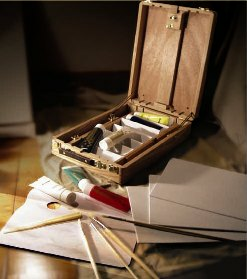 Bring your painting project with you wherever you go with this LELLI’S Deluxe Acrylic Art Kit, which includes a storage box, a selection of supplies and a convenient compact easel. Make art on the go simpler than ever with this LELLI’S Deluxe Acrylic Art Kit, a compact kit of items that help you create great paintings no matter where you are. The kit includes four brushes, seven tubes of acrylic paint in a rainbow of colors, a plastic palette knife and a double-sided wooden palette. Three canvas panels are also included to get you started painting right away. All of the supplies come in a sturdy wooden box, which has a convenient carrying handle for easy transport. An adjustable center column that can hold cavases up to 25.6 inches tall lets you use the box as a tabletop easel, so you have everything necessary to paint whenever and wherever you feel inspired.